This quick and easy recycled light bulb craft fills the bill when you’re looking for last minute Christmas decorations and gifts. And who would ever guess that a light bulb is hiding in this pretty Christmas posie? poinsettia pick, or left-over Christmas florals, with at least three separate branches, each branch having five or more leaves. If you floral pick is less dense than this, use more of them. Such a lovely use of a used light bulb, you’ll want to make more than one! If using the spray paint, clean the light bulb with rubbing alcohol, let dry, and spray paint the bulb completely. This is a nice touch, but the ornament also looks fine without any paint at all. Gather the doily up over the light bulb. You may need to stretch the doily a little to get the gathers to completely cover the metal screw part of the light bulb. Once you are satisfied that the doily will fit, choose a row of spaces to thread through with gold cord or ribbon, so that the ribbon will fit around the lower part of the lightbulb neck, near the bottom of the metal screw threads. Refit the doily over the light bulb, tying in place with the gold cord. Tie invisible thread around the metal screw part of the bulb to create a hanger for your ornament. Separate the branches of the poinsettia or floral pick so that you have at least three separate sections of leaves. Each branch should itself have five or more leaves; if your material is less dense than this, use more than three branches. Take the first branch and insert the stem down between the doily and the light bulb, so that the stem is caught under the cord cord. Repeat with the remaining branches, spacing them evenly around the neck of the light bulb. The cord should be tight enough to keep all the stems firmly in place. 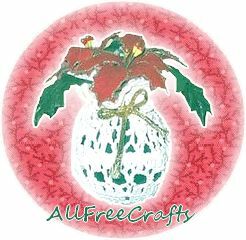 Note: if you are working with left over Christmas foliage from other projects and the stems aren’t long enough to use this way, just secure in place with hot glue or craft glue. Adjust the leaves and foliage so that the metal screw part of the light bulb is completely hidden. Adjust the invisible thread, if necessary, so that your ornament will hang straight when placed on the Christmas tree.